Section 1 Introduction to crack arrest concepts; Section 2 Recent trends in crack arrest research; Section 3 Application of crack arrest concepts. 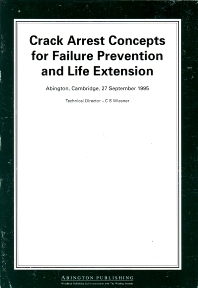 The proceedings of a seminar held at TWI in September, 1995, focusing on crack arrest philosophy which aknowledges that a brittle crack is arrested when it emerges from the critical region. Papers from prestigious researchers presented a critique and assessment of the theory and its application under: Introduction to crack arrest concepts; Recent trends in crack arrest research; Application of crack arrest concepts.